Sleepzone Galway City has won many plaudits since it opened in April 2001.' Remarkably accommodating ... takes the 's' out of hostel' Let's Go Guide. 'Galway's newest and by far best hostel ' Lonely Planet'Galway's newest and most modern hostel'- Rough Guide. 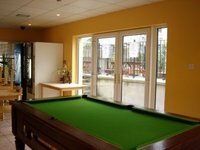 'If you're looking for somewhere clean and secure then Sleepzone is a good place' - Bug EuropeSleepzone is situated in the centre of Galway City — 100 meters from Eyre Square, only three minutes from the bus and rail terminal and close to all the city's amenities, including pubs, clubs, cafes, and restaurants. A clean & friendly hostel our staff are available 24 hours to look after you !Sleepzone is spacious, with over 200 beds in en suite rooms we can accommodate everyone from individual travelers to large student or tour groups.Sleepzone's many modern features include a state-of-the-art internet/computer room with free internet access for all guests (and free Wi-Fi service for those with their own laptops) a modern and fully-equipped self-catering kitchen, electronic luggage lockers, self-service laundry room, pool table, international payphones and a rear barbeque terrace. We also have a luggage room where you are welcome to leave your bags after you have checked out ( free of charge !) until you are ready to travel onwards.If you have just moved to Galway to live check out our “ Moving to Galway “ board for up to date info on accommodation, jobs, getting set up with a phone , opening a bank account & all those other bits & pieces !- Free Internet.- Free Wireless Internet (WiFi).- 24 hour bureau de change.- Secure electronic luggage lockers.- Tourist information and tour booking- 24 hour secure keycard access- No curfew- Book Swap- Movie nights ( Sun - Thurs )- Board Games- Complimentary night club passes- Complimentary Sleepzone map designed by Sleepzone Staff !Don't forget Sleepzone Connemara & Sleepzone The Burren if you're exploring the rest of Ireland !Please note that you must provide picture I.D. on arrival. Sleepzone may also charge a refundable security deposit on some group bookings.